Stop making me want things I haven't ordered, will you please? Just spotted your card on Pinterest and had to come to visit ..... this is lovely! You are very talented! Shop online with me & Stampin' Up! Come join me on the last Friday & Saturday of every month from 10am-12.30pm to make at least two fabulous projects. 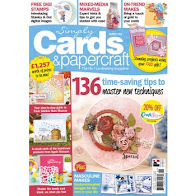 Classes cost £10 which will include all materials and tuition to make cards, gifts and boxes using modern, innovtive techniques and products. Please email for further information on how to book your place. Click on the picture to join on-line today!